Heh, that makes it sound like Indiana Jones and the Temple of the Forbidden IQ. 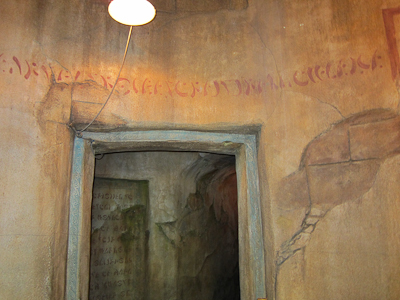 It’s not–this is a post about the line for Indiana Jones. Why just the line? Because the ride broke down. Sad. 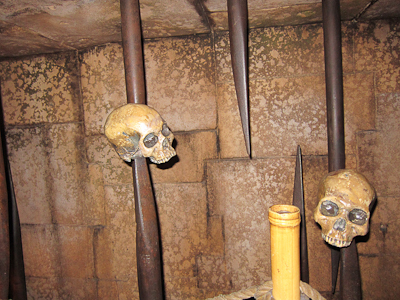 Indiana Jones Adventure is a very innovative attraction. 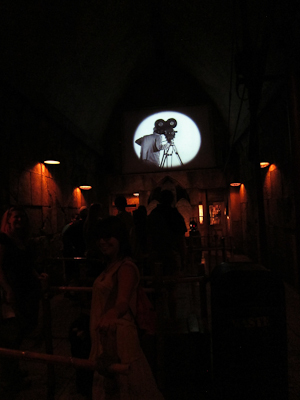 It was really the first to involve a truly interactive queue. 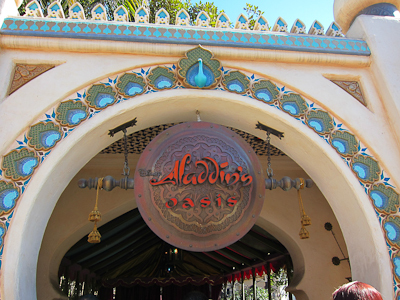 Which was good because when this ride opened, the lines were looooooong. And it’s still pretty popular. 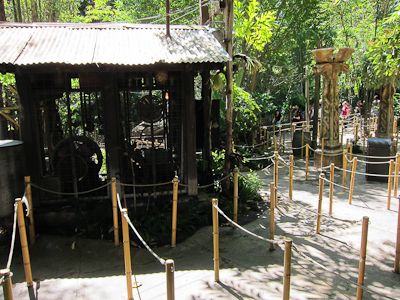 Indiana Jones not only has a stand-by (regular) line, it has a Fastpass AND a single rider line. 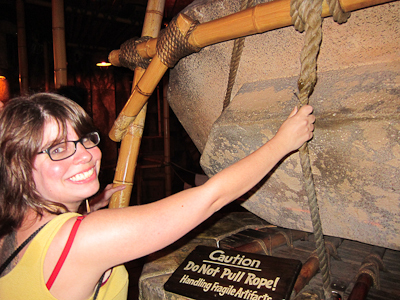 There are many ways to enjoy Indiana Jones! 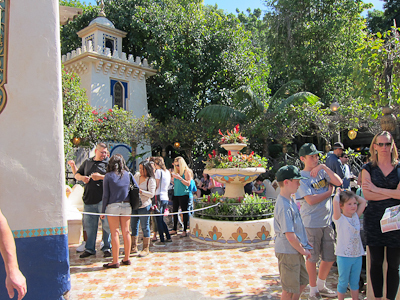 The outdoor part of the queue is a series of shaded switchbacks. 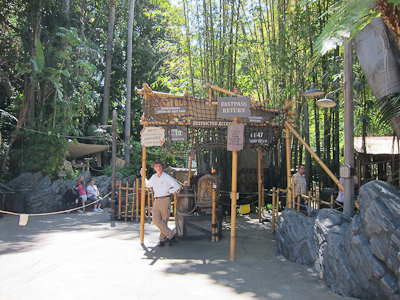 Indiana Jones is right next to the Jungle Cruise, so you really have that Adventureland feel. 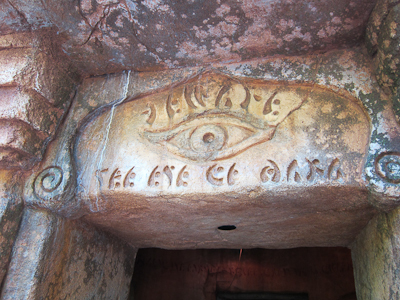 Next you go into the Temple of the Forbidden Eye, where your adventure really begins. Notice anything interesting? If you guessed coded writing, you’re correct! Good job! 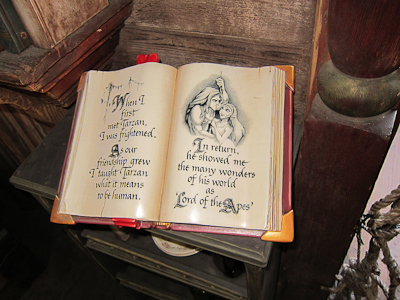 When Indiana Jones first opened, the cast member at the front used to hand you a decoder card so you could actually read the code during your very long wait inside the temple. That was pretty much all kinds of cool. 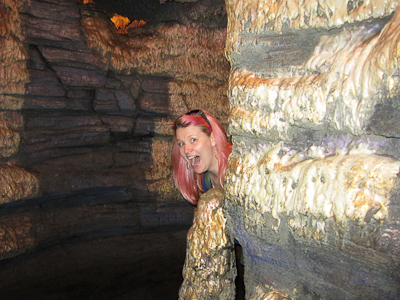 The queue takes you around many bends and curves, keeping things interesting if you have a friend who likes to hide. Which I do. There are a number of things to do, like swing this pole around and see what happens. Don’t goof off at Disneyland, okay? But now when you do, nothing happens. Humph. After that you move into a kind of movie room and get to watch a short film that is both urgent and informative, and kind of a little silly because the dude, Sallah, is TOTALLY freaking out and seems to be completely oblivious to the fact that his entire purpose of life is to be the safety video showing you how to use your seatbelts. It is interesting on the loop though. Then you go some more until you think you’re going to load, but YOU’RE NOT because you still have to go up and down some stairs. However, eventually you do make it to the loading gate. You catch a glimpse of your ride vehicle–an oversized Jeep. And then Ingrid, Rachel, and I were literally next in line to board a Jeep. 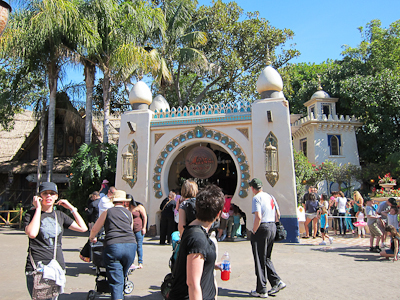 And I mean this literally, we were right up against the gate, when…the ride broke. 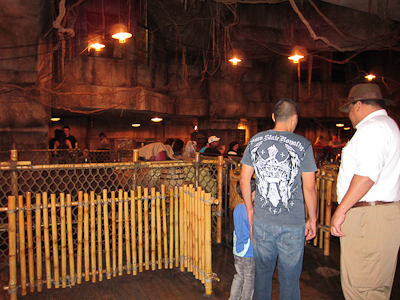 After they tried rebooting the whole system and then the cast members talked amongst themselves in lowered voices, the ride of officially declared defunct and we were asked to leave. 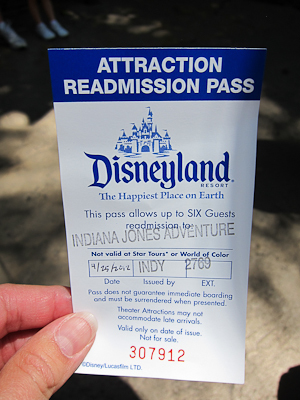 We were offered a Fastpass to return, however. And unfortunately I had to go home soon after, so I didn’t get to enjoy it that day. 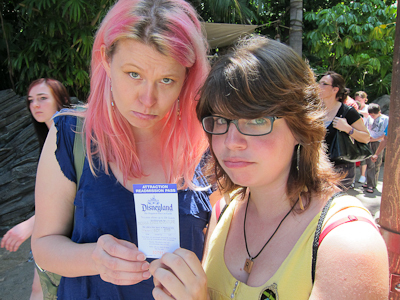 Rachel and Ingrid were very, very sad. Yep, that’s the Tarzan call. You’ll just have to say it in your head with me. 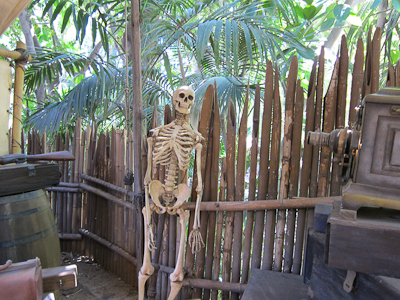 Now over in Adventureland is Tarzan’s Treehouse. Cleverly distinguishable by this sign and also the fact that it's a giant tree. 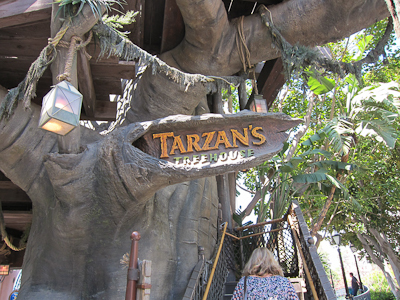 Up to this point I’ve been avoiding Tarzan’s Treehouse because taking a stubborn 3-year-old up and down those steps pretty much sounds like hell to me. Fortunately I got to meet up with my friends Ingrid and Rachel and the three of us decided to go for it. 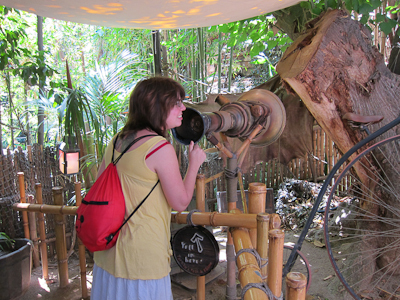 I’ve never actually been in Tarzan’s Treehouse. Shocking, I know, but that’s the whole point of MYWTM. 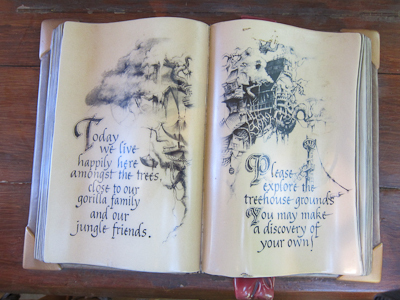 I have, however, seen the Swiss Family Treehouse, which is what Tarzan’s Treehouse was before Tarzan moved in. Poor Robinson family–displaced AGAIN! 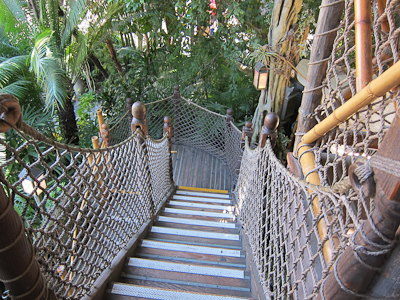 Once you go up the initial stairs of Tarzan’s Treehouse, you cross a bridge to get to Tarzan’s Treehouse. 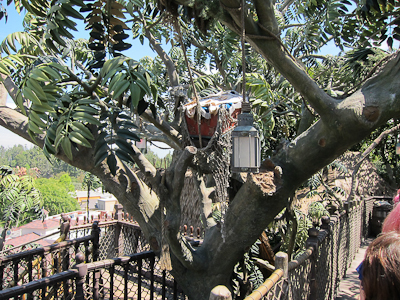 Now the best thing about the Swiss Family Treehouse was the elaborate irrigation system they had. 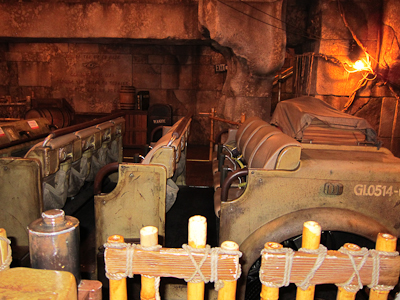 Just like in the movie, there were these buckets and a paddle wheel and little channels for the water to run through. Tarzan, on the other hand, had no running water. So much for that upstairs master bathroom. Bummer. 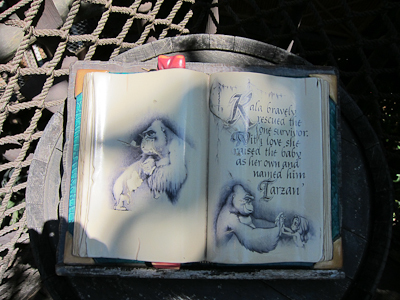 Once you get to the second tree, there are books telling the story of Tarzan. 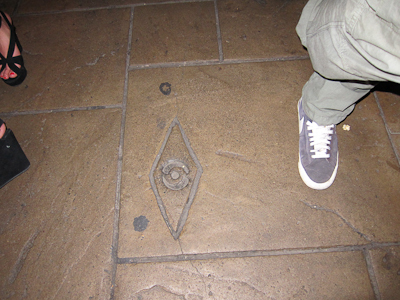 "Many years ago, a young family enjoyed their life here until the fateful night of Sabors attack"
Uh-oh, Disney. Sabor is the name of the leopard. His attack is therefore possessive. 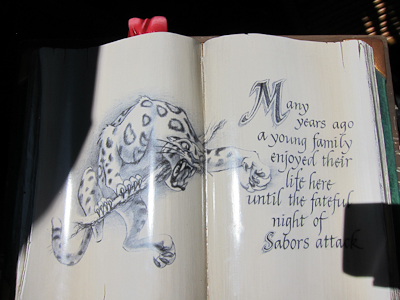 Which means that it should read “Sabor’s attack.” Oops. Anyway, you don’t want to get into that because here is Sabor and he’s pretty much going to eat you. 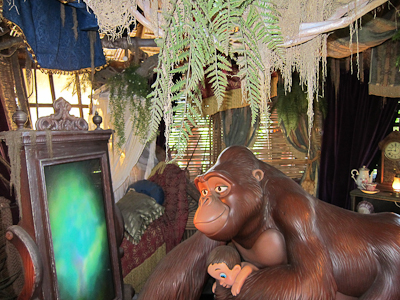 Exit Tarzan’s family, enter Kala the gorilla. Kala and Tarzan make a very cute pair. Here’s a picture of something that I took from the top of the treehouse. 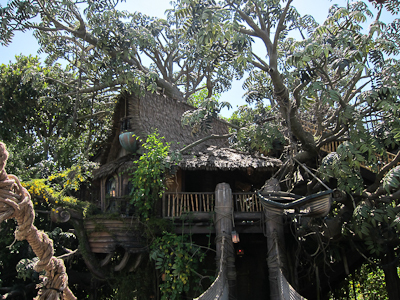 It’s kind of a bummer because when it was the Swiss Family Treehouse, you actually knew what everything was. 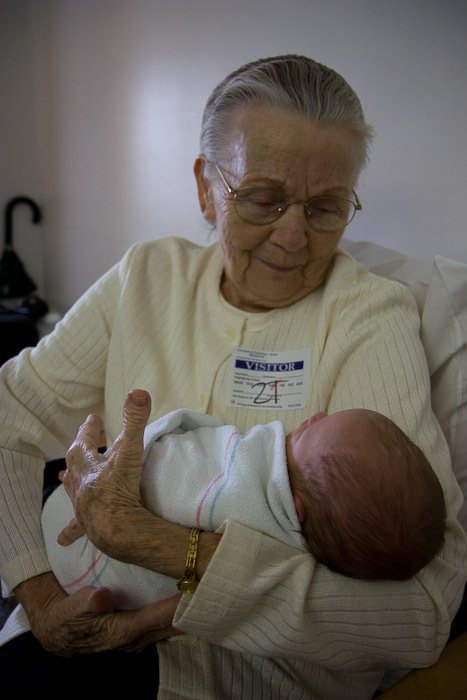 Kala was a great mom, apparently. What are your happy memories? My happy memories of my life, or my happy memories of the movie? Enter Jane and our first look at grown-up Tarzan. 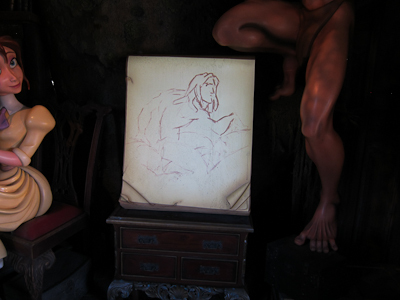 There’s also some kind of magic canvas that draws Tarzan by itself. I’m sure this has some kind of meaning from the movie, and I’m sure one of my sharp-eyed readers will be able to tell me what it is. 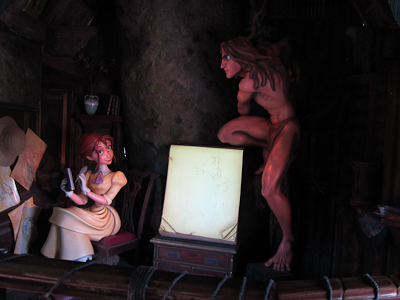 Then Jane talks about teaching Tarzan to be human, and Tarzan teaching her all about the apes. Who got the better deal here? And then it’s time to leave. 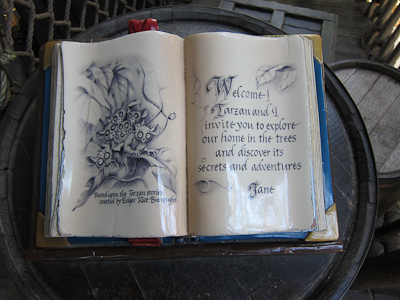 Jane sums it all up by saying they all live happily amongst the trees and take a look around, make yourself at home. What did I say? Hostess with the mostess! The book says “You may make a discovery of your own.” No kidding. OMG, it's a dead person! Definitely did not see that one coming. Down on the ground there are two “rooms.” The Robinsons used them for the kitchen and library, but it’s hard to tell what Tarzan and Jane use them for. 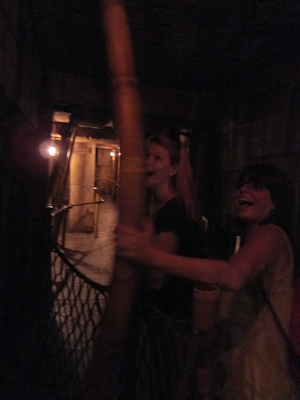 There is a bamboo microphone-looking thing that says “Yell in here,” but my friend Rachel tried it and didn’t really get anything out of it. Maybe a crude intercom? 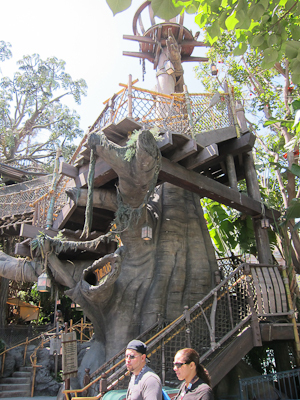 Tarzan’s Treehouse is a fun little Adventureland detour if you’ve got some time on your hands and don’t mind the stairs. However, it’s not as good as its predecessor. Maybe one day Tarzan and Jane will figure out running water. For whatever reason–I’m assuming the sheer popularity of Pillow Pets–I get a lot of search hits on Disney Pillow Pets. Now for those of you not in the know, a Pillow Pet is a stuffed animal/pillow hybrid. Lay it flat and it’s a pillow with a stuffed animal head, but then fold it in half and fasten the velcro and it’s a regular stuffed animal. 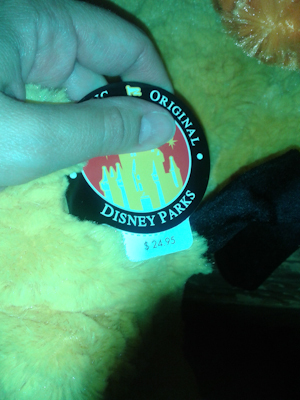 Anyway, so there are some Disney Pillow Pets at Disneyland. 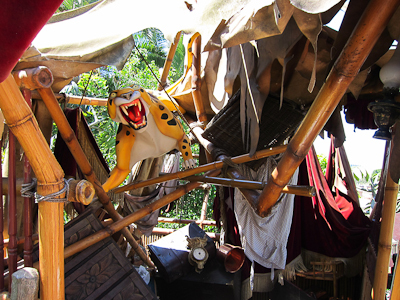 They’re located in Adventureland right across from the Jungle Cruise. Usually they’re more neatly stacked than that. 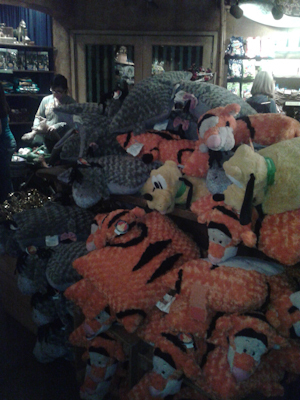 Anyway, the only Disney Pillow Pets I’ve seen are Pluto, Eeyore, and Tigger. 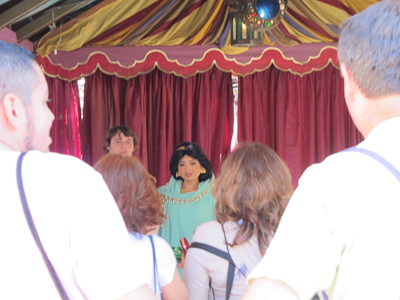 I’m not sure why other characters aren’t represented, but these are the only ones I could find anywhere in the park. They are actually quite cute, so if you’re looking for a Disney Pillow Pet…well, I’m not sure what to tell you because I’ve never seen them offered outside of the park. Though I’ve never looked. But if you want one and you know someone in or near the park, they CAN be yours!! !